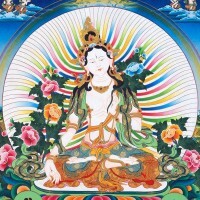 The most popular female Buddha in Tibet, the Goddess Tara arose from the compassionate tears of Avalokiteshvara (Kuan Yin) and made the vow to return always as a female Bodhisattva to help all beings. Drawing upon the energies of the gentle female Buddha Tara, this puja swiftly fulfills our wishes. Tara practices are also renowned for generating the energies to invite harmony, success and serenity for all aspects of our lives, especially in relationships, families and spiritual well being. This puja is available in the Kechara Puja House in both Small and Medium puja sizes, depending on the scale of the problem. Click here for more information.